A well-crafted porch adds character to the exterior of any home, and can increase the value as well. Custom built porches should be designed to match the rest of the home and add to the overall beauty of the exterior. Domenico Parravano and Sons has been crafting beautiful porches for homeowners in Baltimore City, Towson and Baltimore County since 1977. Enjoy the comfort and luxury of an indoor space while taking in the sights and sunlight of the outdoors. Sunrooms are usually constructed with up to 3 walls of glass windows. Screened-in porches allow the breeze and fresh air in, but keep mosquitoes and other pests from joining the party. We can screen in existing porches and decks or build new construction to incorporate screening. Sometimes simple is best. An open air front porch invites guests into your home. Consider decorative railings or columns to add an elegant touch. Open air porches can be constructed with a permanent or retractable roof or awning. Pressure treated pine is a traditional and affordable material to use in porch installation. More premium hardwood may also be used. We choose premium grade wood and visually inspect each piece. All wood is thoroughly dried prior to installation. We use quality hardware for our installation, to ensure bolts, nails and screws remain in place as the wood dries and contracts. Composite construction materials can be used in your porch installation in a variety of shades and colors. 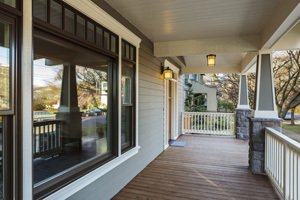 Composite porches require less maintenance than traditional wood porches.